The principal aim of the project is the development of novel, biomimetically optimized branching joints for fibre composite truss structures in architecture and constructional engineering. 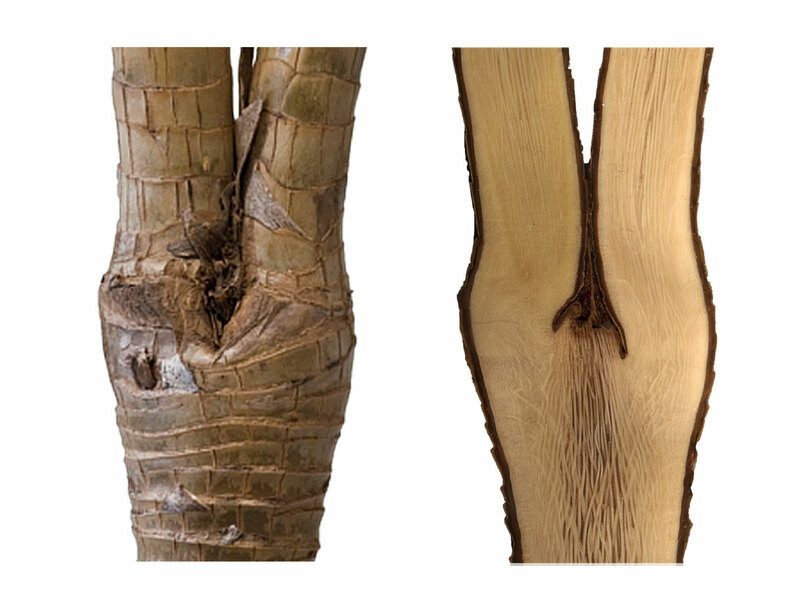 Biological concept generators will be arborescent and herbaceous monocotyledons such as Dracaena, Yucca, Nolina, Pandanus, Freycinetia which hold fibre-matrix structures in their branchings that are markedly different from those of other woody plants (Fig.1) and branchings of lightweight monocot plant stems as e.g. Semiarundinaria for the adjoining of beam segments. Other interesting concept generators are sedges and grasses such as Carex or Secale in which the leaves are connected via a leaf-sheath that encompasses the stem. Additionally, conspicuous branchings in dicotyledons (e.g Schefflera and Angelica) and peripheral reinforcement structures as present in, for example, in the mint family (Lamiaceae) will be investigated. These plants are all light-weight and evolutionary adapted to bear static and dynamic loads. Therefore, they are well suited to serve as concept generators for highly loaded branching joints and adjoining beam segments in truss structures made of fibre composite materials in constructional engineering. As is the case in many plants, technical branching joints need to be stiff, ductile, and damping in order to withstand the various and complex loadings of the overall structure. To date, the fabrication of branched joints requires complex expensive frameworks for concrete or for cast steel or the elaborate welding of steel members. Within the project, new materials, new structures, and new fabrication methods for bio-inspired branched constructions will be developed and combined. The novel concept consists of a light-weight branching made from fibre-reinforced polymers (FRP) with load-adapted fibre orientation, which serves as the outer framework (termed here »jacket«) for a concrete filling and also as the tension member to bear torsion/tension forces. To make FRP–branching points, a new weaving technology can be used to develop woven branched hollow structures in which the fibres are placed mainly in hoop direction and longitudinal direction. With a new braiding technology, we shall be able to develop load-adapted fibre lay-ups in which fibres can be aligned according to the fibre orientation of the highly load-adapted biological concept generators. The novel combination of the two textile processes creates a new type of fibre-reinforced tension-bearing hull for the stabilization of branched architectural concrete structures. Our research will also aim to enhance the structural connection between the FRP jacket and the concrete filling. 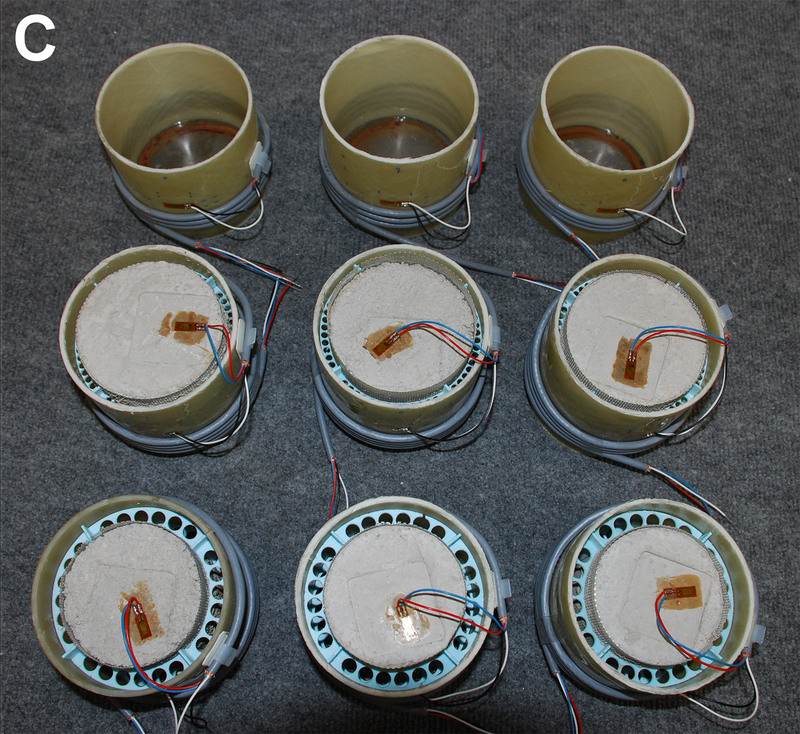 These techniques can then also be used outside the TRR 141 for the production of biomimetic bifurcations. 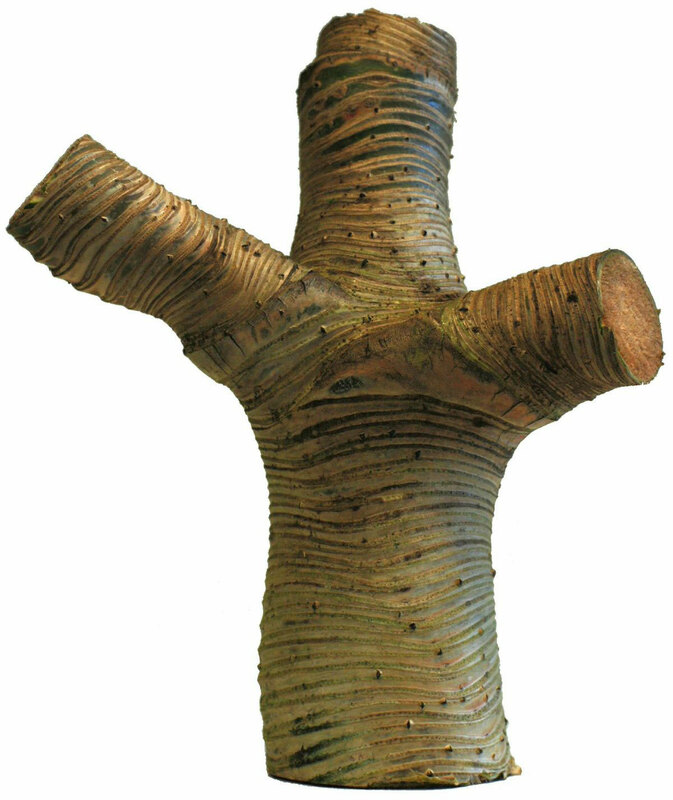 A prerequisite for such technical implementation in architecture is a detailed understanding of the basic mechanisms underlying the resilience of branching joints and their high load-bearing capacity, which can in turn also serve as a starting point for a detailed mechanistic understanding of biological organisms with certain properties (reverse biomimetics). This is approached via Finite Element simulations of models for biological concept generators. A subsequent quantitative analysis of these simulations also includes the investigation of functional robustness with respect to uncertain model parameters via sampling-based approaches. 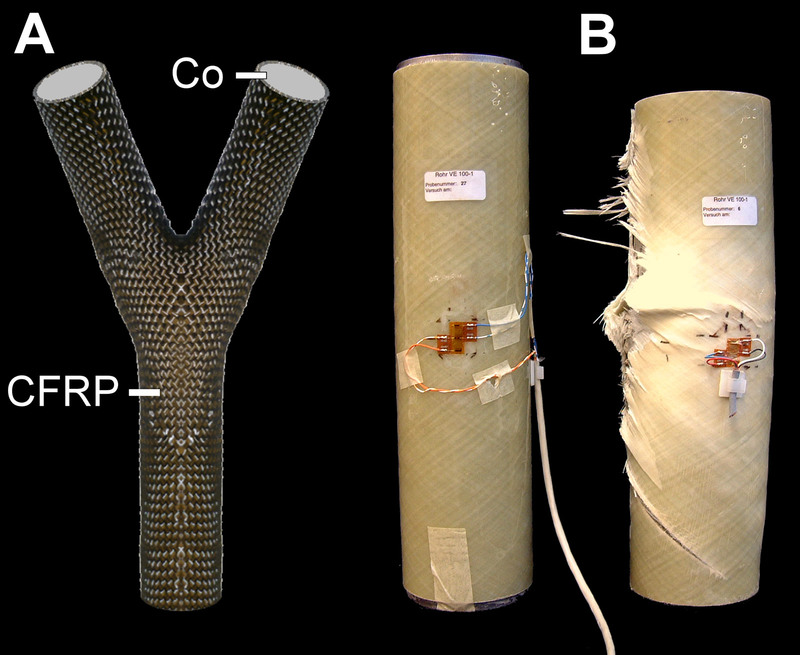 Left: novel biomimetic carbon fibre-reinforced polymer (CFRP) developed by the ITV that can be filled with concrete. Right: specimen for preliminary test on FRP confined concrete before loading. Concrete-filled FRP tubes: preparation of test specimen with an interlayer of 6 mm and 12 mm for free-flowing expanding grout (Eurogrout). Branching of Dracaena fragans. 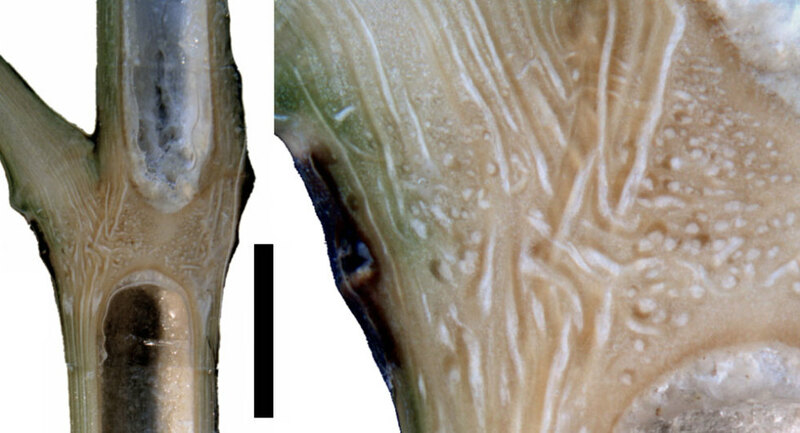 Outer view of stem (left) and longitudinal section (right). Semiarundinaria sp. Overview and detail, scale bar 10mm. Stem and branches in Pandanus pygmaeus.